Click on an image or a school name to see an enlarged image. 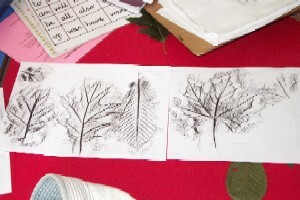 Can you tell the difference between a horse chestnut, and a silver birch? There are lots of wonderful trees to be found in London's parks, and in school playgrounds, and children from several different schools have been learning more about them! Children from Reception to Year Three at Oakthorpe Primary School visited Tatem Park during their school's Science Week to learn more about the animals and trees there. Among others they found a ginkgo tree, which is a living fossil! Ginkgos are the only living representative of the order Ginkgoales. Their earliest leaf fossils date back 270 million years to the Permian period, so in the era of the dinosaurs (Jurassic 213 million years ago) they already existed. They were thought to have become completely extinct, but were found to be still growing in Japan in the 19th century. Seeds were carried all over the world from Japan, and now they grow in many countries. 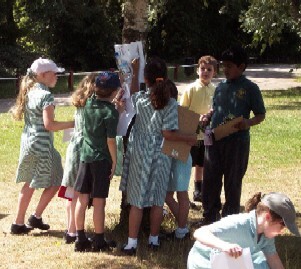 Year Three Children from Saint Monica's RC Primary School in Palmers Green visited Grovelands Park with a tree identification chart, and got more & more excited as they checked each new species off!